A sequel of sorts to Journey To The Center Of The Earth, albeit with only one returning character (Josh Hutcherson as young explorer Sean Anderson), Journey 2: The Mysterious Island is breezy fare at best, neither offensive nor game-changing. When Sean decodes a signal sent by his missing grandfather, Alexander (Michael Caine), he recruits his mum’s new boyfriend, Hank (Dwayne Johnson), to accompany him on an adventure. Enlisting Gabata (Luis Guzmán) and his daughter, Kailani (Vanessa Hudgens), who agree to fly them to the co-ordinates, they set off in a bid to discover the mysterious island and save Alexander. Journey 2: The Mysterious Island was never going to be a masterclass in narrative brilliance (I mean, come on, did you read that synopsis? ), nevertheless screenwriters Mark and Brian Gunn power on through, dutifully carving out a mildly entertaining family adventure. Though hinged on set-pieces and slapstick comedy that only belittles the actors delivering the tiresome dialogue, it works to a certain degree simply by the fact the writers never make it out to be something it’s not. Where the narrative fails, the cinematography is a delight, with the director, Brad Peyton, basking in short, sharp bursts of pretty colours and dream-like scenery. Andrew Lockington’s score in itself is enough to cover the most annoying of cracks thanks to its sheer alert nature, putting you in mind of the work John Williams did for the Indiana Jones films. Its central problem is the fact you can’t help but feel its only purpose it to capitalise on its predecessors unexpected success – something that is never purposefully countered by anyone involved. Still, the actors give their all, and it’s nice to see Caine take on more light-hearted material. Johnson is watchable to a certain extent, but he has little to no chemistry with Hutcherson (an actor certainly worth more than “breezy fare” after his stellar turn in The Kids Are All Right), which makes there on-screen relationship all the more cringeworthy. 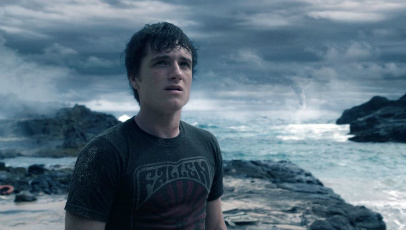 For a film of its nature, Journey 2: The Mysterious Island isn’t bad. It moves along at a brisk pace, has some enlivening set pieces (Caine riding a bee is a particular treat for the eyes) and is almost entirely inoffensive. Instantly forgettable, yes, but a congenial Sunday morning amusement nonetheless. It wasn’t as bad as most re-done sequels tend to be, but it wasn’t very good either. Bland. I don’t even know how I finished up right here, but I thought this put up was great. Regards! Thank you for the good writeup. It if truth be told was a entertainment account it. Glance advanced to far delivered agreeable from you! By the way, how can we communicate? You realize, you need to had one of all those tweet/facebook share buttons it’d make it less complicated for us to share your articles on social web sites.